I am always looking for something new to add to my Christmas tree each year. My tastes haven’t changed much from year to year. 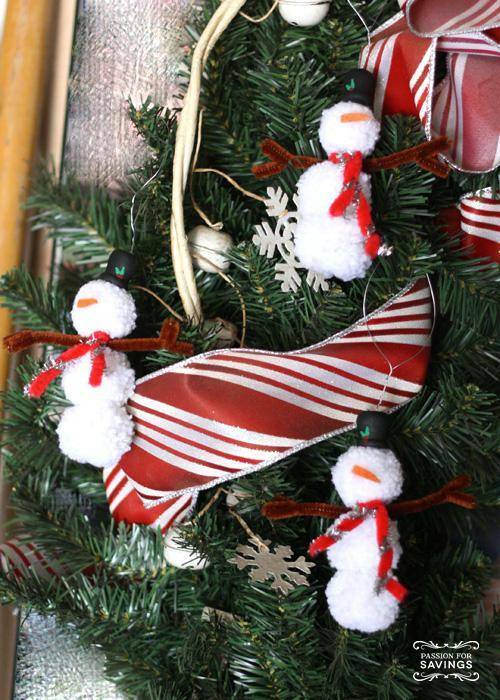 I still like the classic red and white and I just absolutely love snowmen! So I wanted to go with something along those lines when I was thinking of making fun DIY Christmas ornaments this year. I also wanted something that the kids could get involved with. I love how these pom pom snowmen turned out! I started out by making small pom poms with some white yarn I had in my cupboard. Here is a tutorial on how to make mini pom poms if you want to give it try for this project. They are easy to make, they just take a little time to get them to look the way you want. For a hat for the snowman I found these candle cups with a hold in the bare wood section of the craft store. They were by the wooden spools which you could also use if you wanted to cut them in half. I used acrylic paint to paint the hats black and then added a little holly to brighten them up. I used a small paint brush for the holly berry leaves and the end of a paint brush for the berries. For the arms and the scarf I decided to use pipe cleaners. I like that you can get any color you want, and that they are easy to bend to make anything you want. For the arms I just decided how big I wanted one side, twisted a loop in the middle and then did the other side to match. For the scarf I just twisted 2 pipe cleaners together, decided how long I wanted it, looped it in the middle and did the other side before I trimmed it. I then created a big loop and then wrapped the remaining wire around itself toward the snowman and trimmed it. See how I left that little end sticking out? That helps hold down the hat and keeps all the pieces from moving around too much. I used a piece of orange felt and cut out a small carrot nose. Just glue that on with hot glue or craft glue. Aren’t they so cute all hung up along with my red and white decorations?!?! They are a perfect addition! We had mixed feelings about the faceless snowman so with the end of the paint brush I added some eyes and mouth. I like them with out the eyes and mouth, but either way I think they are fun and the kids would love to help make them. These DIY Christmas ornaments would be fun for a class party, teacher gifts, attaching to your neighbor gifts, or just adding to your own decorations.